The 2015 Methow Singletrack Solstice will take place in and around Winthrop, Washington on the weekend of June 26,27,28. Participants will experience great riding, socializing, an amazing raffle, and other mountain biking fun. Most importantly though, all proceeds from this event support the Methow Chapter’s mission and efforts to improve mountain biking and trails in the Methow Valley. Other than membership dues, this event is the Chapter’s primary fundraiser of the year. Those who register for the Singletrack Solstice and become a new member of the Methow Chapter of Evergreen will save $10. All registrants will receive lunch Saturday at the Chicadee trailhead, breakfast Sunday at the town park in Winthrop, a raffle ticket for a chance to win great prizes, and will be eligible to take part in the Singletrack Solstice Snapshot Contest and have a chance to win prizes for the best pictures capturing memorable moments during the Singletrack Solstice weekend. Riders can also choose to sign up for an optional 30-mile point-to-point ride on the Twisp River Trail, over Thompson Ridge, and down to Winthrop through the Sun Mountain Trails. This ride features approximately 1800 feet of climbing and over 3100 feet of descending. Riders wishing to do the point-to-point ride must PRE-REGISTER by 8pm June 24th. Registration packet pick-up and check-in will be Friday evening from 6pm to 8pm at the Winthrop Pump Track just west of the baseball field, near the west town limits on State Route 20. Feeling a little stiff from sitting in the car? Jump on your bike and take a few laps on the pump track to get that blood flowing. We’ll also have some light refreshments on hand, so hang out a bit and chat with other riders here for the Solstice. Saturday features some great mountain biking and lunch served at the Chickadee Trailhead at the Sun Mountain trails. This year’s point-to-point ride option will see riders boarding the bus for a grand day out at the upper ice rink/town trailhead parking lot in Winthrop. The bus will roll out promptly at 8am and will drop riders off at the Poplar Flat Campground along the Twisp River. Riders will then enjoy approximately 10 miles of generally descending singletrack on the Twisp River Trail. A short section of pavement on Twisp River Road will take riders to the base of the climb up Forest Service roads to the top of Thompson Ridge. 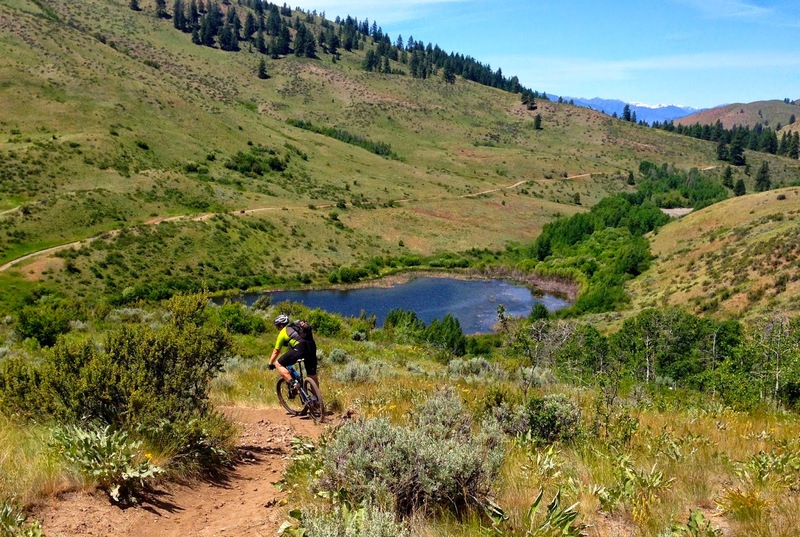 From the top of Thompson Ridge, a fun Singletrack descent through the Sun Mountain Trails will bring the riders to the lunch stop at the Chickadee Trailhead. After refueling, the riders will descend the Winthrop trail back to Winthrop. After 30 plus miles and many hours on the bike, it will have been a grand day out for sure. For those Solstice registrants not choosing the point-to-point ride option, lunch will still be served at the Chickadee trailhead enabling them to enjoy some great riding at Sun Mountain and refuel after (or fuel up before for an afternoon ride). Skills structures will also be set up at Chickadee so riders can try their hand at riding, bridges, skinnies, and teeters. The Singletrack Solstice will wrap up with a breakfast by the river in the town park in Winthrop for all participants. Photo contest awards and raffle drawings will also be on tap for the breakfast. This will also be a great time for riders to share their stories with each other and maybe even make plans for an afternoon ride to complete their weekend. Below are just a few images from the 2014 Singletrack Solstice. Don’t miss out on the fun this year, REGISTER NOW!